A lighter-weight all terrain stroller at only 24 pounds, the Mountain Buggy Urban Jungle is “engineered for the urban active.” This awesome three-wheeler seamlessly takes you from city streets to the beach to park trails. I am so impressed with the Urban Jungle! The phenomenal features on this outdoor warrior include everything to keep you and your child safe and comfortable. 12″ tires with rear suspension smooth the bumpy ride for your little one. Shield your child from any angle of the sun with a “follow the sun” canopy with flip-out visor. From birth to 77 pounds, the seat can recline in multiple positions and the tough aluminum frame is travel system or carry cot compatible. Several upgrades for 2013 take the Urban Jungle up a few notches in quality. It has a redesigned bumper bar, a tail-free harness for your child, zip fabric sling for easy on and off to wash, and an auto frame lock for better stowing after folding. These are the improvements, and the time you finish reading this page on the Mountain Buggy Urban Jungle, you will discover all the exciting features that make this one of the best all-terrain strollers out there. Let’s get started, shall we? 0.4 From newborns to children up to age six, the Mountain Buggy Urban Jungle has a variety of seating options for your child. 1 What about the fold? 2 And the sun canopy? 5 Any accessories I might want? 8 Where should I buy this product? From newborns to children up to age six, the Mountain Buggy Urban Jungle has a variety of seating options for your child. For newborns: The seat is now easily removable with the zip-off feature (it used to have snaps). Take the main seat off and click a car seat right onto the chassis (via an adapter sold separately ) for an all-terrain travel system. Stability with the car seat on the Urban Jungle is designed with maximum safety in mind and is in accordance with market safety standards. This gives you needed reassurance that three-wheelers are stable as a travel system. A sophisticated way to go with your newborn is to turn your Urban Jungle into a pram with the Snug Carrycot. The Snug Carrycot carries up to 20 pounds. It has a comfy, soft lie-flat mattress and carry handles on the sides for easy transfer from the stroller. It also clicks right into your Urban Jungle frame, and as you see with the photo on the right, it looks stunning. Like a parent-facing option? In the photo at right you see a new accessory called Face-to-Face Parent Facing Seat, a smaller seat that clips right into your Urban Jungle frame. 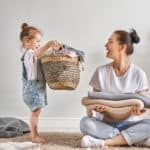 Enjoy more bonding time with your little one while you’re on the go and baby has outgrown the carry cot or car seat, yet isn’t quite ready to look out into the big, big world with the main toddler seat. The Face-to-face seat holds up to 20 pounds and includes legs that transform the stroller seat into a deck chair that you use at home. It comes only in black and has a 5-point safety harness and easy-to-clean soft fabric. Now, do be aware that the canopy you see in the photo does not come with the Face-to-face seat. You will have to buy the canopy separately, but you get four colors to choose from, depending on what is available from the merchants. Once your child has outgrown the bassinet, car seat or parent facing seat, it’s showtime for the toddler seat. The new zip on fabric is much more convenient to take on and off and you’ll install the seat into the frame in no time. Infinite recline positions are one-handed with a strap – get that angle just right while your child sleeps. I like how the upright position sits up straight. How can such a big kid ride in this stroller? The seat is quite wide at 14 inches and the seat back is 23½ inches. The seat to canopy is tall enough to leave enough space for your child’s head, especially since you can now slide it up the frame a bit. Total weight capacity is up to 77 pounds which means older kids can hop on board. Folding the Mountain Buggy Urban Jungle is a one step process; it used to be three! First lock the brakes. Then walk around to the front and pull up on the two latches on either side of the footrest. The stroller collapses. New for 2013: an automatic frame latch secures the stroller together for storage. This replaces the strap you had to secure yourself, adding another step. Thanks for making it more simple! 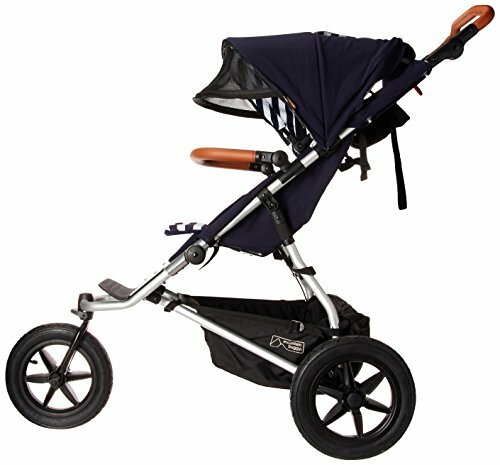 Reviews comment that while the fold is easy, the Urban Jungle is still rather bulky, which is the norm for all terrain strollers. I like the sun canopy; it pivots forward to follow the sun. No need to purchase one of those canopy extenders to shade your child adequately! A flip-out mesh visor provides additional protection. Check your passenger with the large peek-a-boo window on the top. The flap covering it is secured with Velcro, and I’d rather see a magnetic flap. The canopy can adjust up the frame to accommodate taller children. Your child is well-cared-for in the Urban Jungle, but you’re certainly not neglected! One of the convenience features both parents enjoy is the ergonomic height adjustable handle. Whether you’re a petite mommy or a daddy over six feet tall, the handle goes as low as 31″ up to 44″. Then you have the storage basket beneath the seat. It’s a very good size and complimented in reviews. As you can see in the photo, it has little pockets throughout the basket, both inside and out, to keep little things from getting lost in the bigger area. I’ve always liked that. The basket has an 11 pound carrying capacity, and some parents have said that they carry bags of groceries in the basket. While there isn’t a parent organizer, you do get a bottle holder, probably for your water. It is attached at an angle, and you can see it in the top picture, so it is not suitable for hot drinks. There have not been any complaints in any reviews about not being able to have a hot drink cup holder, though. One of the most frequent compliments this stroller receives is how well it maneuvers. Rear suspension means a smoother ride for your child when going over bumpy terrain. Lock the front wheel straight for more stability going over the rougher areas. Several moms mention the single handed maneuverability and how easy the Urban Jungle is to take over different terrain. The three 12-inch air filled tires give your baby a smooth ride and make it easier to push. Parents say it turns on a dime and handles the bumpiest trails. Because the tires are air-filled, keeping a tire pump around is a must. In addition to the five-point safety harness, your Mountain Buggy Urban Jungle comes equipped with a safety tether to maintain contact should you decide to jog with it. A tether around your wrist is used in case you trip and fall, your stroller won’t get away. It also keeps you in physical contact with your stroller at all times, like at an intersection as you wait to cross. For me, I’ve always needed that connection that brings me peace of mind. Now I love the brake pedal on the Urban Jungle; Mountain Buggy thinks of everything! All you have to do is step down once to engage both back wheels securely. Flip it back up to go; it can’t get any more simple than that! 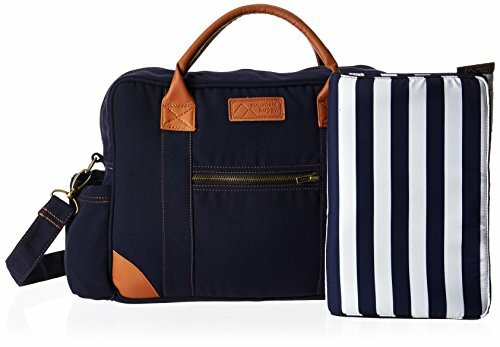 Any accessories I might want? 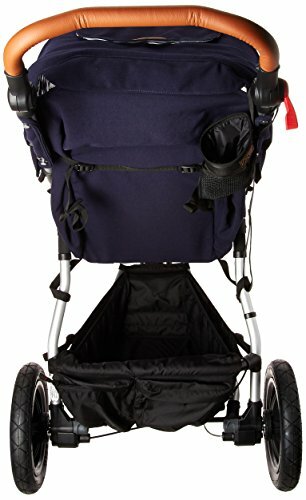 The coolest accessory for Mountain Buggy is the Free Rider stroller board and scooter. 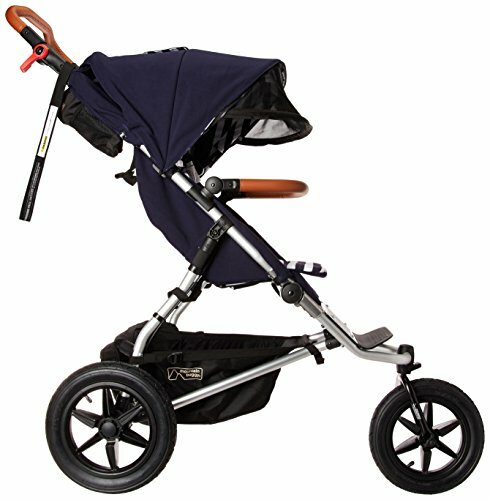 Your older child rides along behind the stroller with the scooter attached to the rear axle with a connector you also have to buy. Easily disconnect the scooter and your child has fun with a toy that goes everywhere just like the stroller! I think this is a fantastic idea. And I’m not the only one who thinks so; the FreeRider is the winner of the JPMA Innovation Award 2011 and the Kind + Jugend Innovation Award 2010. Protect your child from the wind and rain with the Storm Cover. It fits securely to your Urban Jungle and I like that it has a zipper front for easy access to your child. It’s gotten 4½-star reviews, too! For families living in parts of the country with strong sunlight will appreciate having the mesh sun cover for additional protection when the canopy simply isn’t enough. The mesh covering has 81% UV filtering and like the storm cover, it has easy access to your child with the zipper door. Taking a vacation? Transport your Urban Jungle with no fear of damage in the Mountain Buggy Travel Bag. This bag has a wide shoulder strap and plenty of padding to protect your stroller. Additional pockets are provided to store little things like your tire pump. To fully round out your stroller and give it everything you could want, you can get that cup holder for your hot drink and extra storage bags for your shopping. Make your baby as comfortable as possible with a variety of seat liners that provide warmth in winter and cool in summer. This new stroller has been getting outstanding reviews with high ratings. Parents recommend the Mountain Buggy Urban Jungle for the one-handed fold, and the compact size and weight for either single or double version. The air-filled tires give an incredibly smooth ride and easy maneuverability. Parents love the recline on the Urban Jungle seat. It’s very comfortable for kids and easy for parents to do. The adjustable handle is very important. Petite moms have said that because the BOB Revolution did not have an adjustable handle, they chose the Urban Jungle. Quite a few parents have said that Mountain Buggy/Phil and Teds customer service is very good. If they have a question or a problem, Phil and Teds is on the ball getting them taken care of. That’s certainly reassuring! The latest edition of Baby Bargains gives an overall A rating to Mountain Buggy. So far the few complaints have been about the tires. A few parents have said that their tires wear out really fast, and others have tires that punctured easily. I regularly check prices and I always recommend that you buy from Amazon to find good deals from the new 2013 model to previous years sales. You can get all the accessories you need there too. To comparison shop, do check Comfort First because they are a reputable retailer with free shipping and sitewide sales. 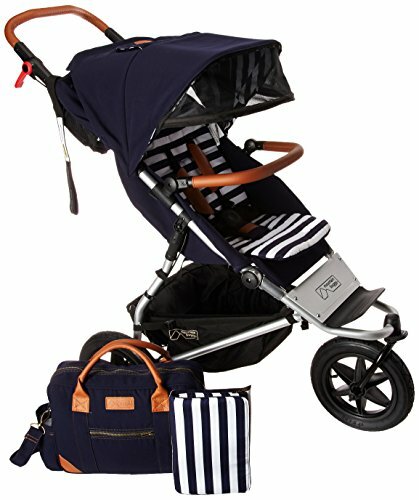 MyStrollers.com is another reputable site with good deals.